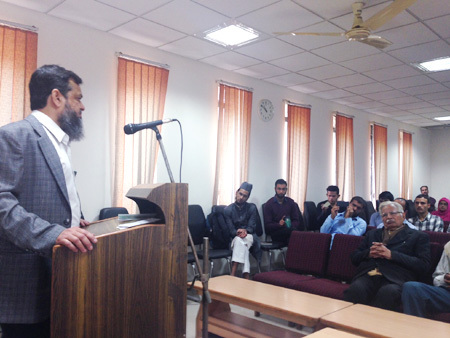 Assistant coordinator of the chapter, M. Serajuddin Khan, invited Prof. Mohammad Muqim who formally welcomed the speaker and the audience and gave a brief introduction of the institute and contributions made by various chapters as well as the headquarters after recitation of a verse from the holy Quran. 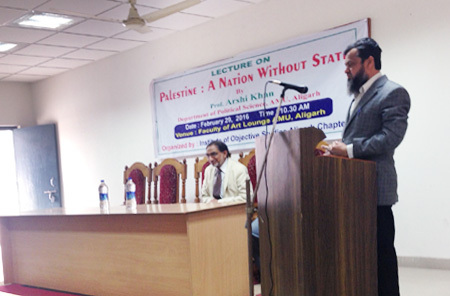 Speaker of the day, Prof. Arshi Khan, from the department of political science, A.M.U., Aligarh delivered the above lecture in which he mentioned various aspects of the Palestinian nation waiting for long to have their own sovereign state. Though the Palestinian National Authority is recognised by more than 135 countries, many of its formal aspects are yet to be realised to be equal partner with other countries in international community. Palestinians have their own territory, history of freedom, heritage, leadership, economy, government, bureaucracy and police, but they don’t have their own formal state with sovereign borders, army and full diplomatic recognition in international bodies. It is a fact that the Palestinian case is the most legitimate in the world today, but the Western world, especially the United States, have not fulfilled their promises mainly due to Zionist pressure. International recognition of the Palestinian predicament has certainly increased over decades, but they have been experiencing losses, damage and weaknesses continuously after 1991, and more so after the destruction of Iraq in 2003. Today the Palestinian leadership is also divided between Gaza and West Bank. Continuous internal and border conflict in the Arab world and the silence of the Arab League, the GCC and OIC have badly affected the Palestinian cause. Occupation is perhaps the worst form of crime against humanity which, in the case of the Palestinians, has proved to be humiliating and disastrous. More than 52 years of military occupation of Palestinian territory has not only been a testimony to the mockery of international law, but also incited hostility and disturbance in the Middle East. The continuing freedom movement of Palestinians and their heroic struggle against Israeli occupation and Israeli war machine has legitimacy and relevance in the UN charter. Colonisation of Palestine and the Israeli policy of employing military means for pursuing its agenda of continuous expansion through Jewish settlement and rejecting the sovereign rights of million of uprooted Palestinians have shattered confidence of even moderate Palestinians towards Israel sincerity for a peaceful settlement. After the election of Ariel Sharon, the supposed Israeli democratic polity was transformed into a kind of concentration camp for the Palestinians whose dignified survival has become a serious question for the entire human kind. Israeli occupation has been the major source of tension and conflict in the region. Occupation is the antithesis of democracy, progress, freedom, equality and peace. Occupation is the root cause of security problems for Israelis on one hand and endangering entire Palestinian community, on the other hand. This occupation will prove fatal to those who believe in controlling human beings with war machines. It is a civilisational crime. The recent declaration of Israel to build more Jewish settlements on Palestinian land and massive shelling of Palestinians will escalate the already tense situation. The trouble began on September 28, 2000 when Israeli police shot dead five and injured 200 Palestinians, which led to a spiral of violence in which Israeli forces killed more than 400 and injured over 2,000 Palestinians. More than 3,500 Palestinians have been permanently disabled. Israeli security has not spared even the personnel of the Palestinian National Authority, which deserve parity within international law. Israel used rockets, missiles, snipers, bombs and tanks against unarmed Palestinians and Palestinian civilian areas. On the other hand Jewish settlers, who have no locus standi in international law, have been acting as warmongers against Palestinians. Yasser Arafat repeatedly appealed to Israel to withdraw new deployments from Arab areas to end violence and to talk peace but Israel maintained its strong military presence on the pretext of security. Killings of innocent Palestinians were described by BBC as “security operations” whereas Palestinians equate it with war and genocide. People and leaders across the Middle East and South Asia have protested against Israel and the US targeting innocent civilians. Such condemnations should be examined objectively. On September 12, 2000 both Al-Gore and George W. Bush categorically said in an election debate that they stood by Israel. In the UN Security Council, the resolution against Israel was moderated under US pressure, which also abstained from approving the resolution. But the resolution did not even name Israel or Arial Sharon, except criticising “excessive use of force” against Palestinians. The first visit of the US secretary of state Colin L. Powell also failed to highlight the Palestinian problem. Israeli crime against humanity is presented by the entire Arab world. Had any country killed an equal number of Jews on any pretext, the US would have resorted to armed action, condemnation and sanctions in the name of democratic intervention and human rights. Iraq’s use of scud missiles against Israel in 1992 led to Israel’s open access to all kinds of US weapons. The Serb conflict with Albanians led to NATO intervention and sanctions. Moreover, NATO forces were deployed in Kosovo against the will of Yugoslavia. But in case of Palestinians, UN, EU and US have not thought beyond calling an emergency summit, that too for giving more advantage to Israel. Earlier, they interpreted the UN Charter and the Charter on Regional Arrangements to use force against rogue and murderous states for promoting popular sovereignty . In the case of Israel, the US and UN have adopted the policy of appeasement. The UN, which artificially created Israel in 1948, has failed to check Israel’s excesses against Palestinians. Israel has violated a large number of UN resolutions, but it was never pressured by the US or EU to follow them or to face repercussions, while, in the case of Yugoslavia, a single violation of UN resolutions brought about the use of force. 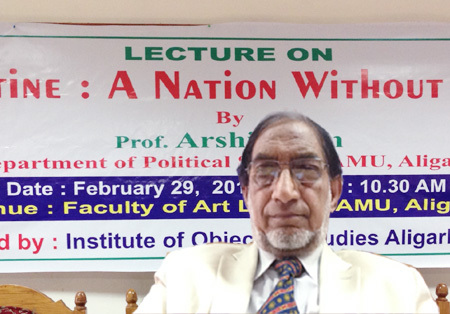 After the lecture was over a good number of P.G. 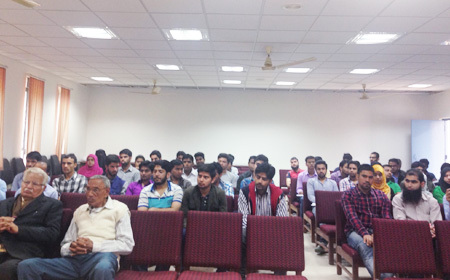 students, research scholars and teachers shared their views with the speaker during question-answer session. A vote of thanks was proposed by Mohammad Serajuddin Khan.